Bob Mankoff is the wise-cracking cartoon editor of the New Yorker. How does he pick the cartoons for each issue? What does that cartoon mean anyway? And- most importantly - how can I win the weekly caption contest? These questions and more - in addition to a highly engaging and copiously illustrated memoir of his childhood and career ladder to his current position - are answered in this entertaining book. 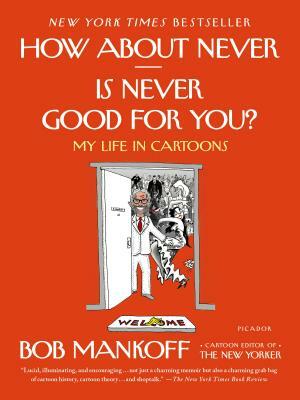 A great read for anyone who loves the New Yorker and its cartoons! Hi, this is me, Bob Mankoff. And this is my memoir. In it I'll usher you into the hallowed halls of The New Yorker (Shhh! Quiet, you'll upset the fact checkers) to show you the soup-to-nuts process of cartoon creation, giving you a detailed look not only at my own work, but that of the artists who keep you laughing every week, except, of course, when they don't, puzzling you with a cartoon that you "don't get" and then you shoot me an email asking me to explain it. Well, you can stop the shooting. You're holding the solution to those cartoon puzzlers in your hands (it's in chapter nine). What else? Oh goodness, self-effacing, humble me has left out the personal part, the essential me-ness part, forged in 1950s Queens New York where I became a wisecracking Jewish kid who mimicked Jerry Lewis, did funny drawings, and turned my mother's Yiddishisms into American humor, leading straight to a career as a successful cartoonist. Nah, that's not the way it happened. You'll need to read the book to find out how it really went down. Bob Mankoff is the cartoon editor for The New Yorker. Before he succeeded Lee Lorenz as editor, Mankoff was a cartoonist for the magazine for twenty years. He founded the online Cartoon Bank, which has every cartoon since the magazine's founding. He is the author of the book The Naked Cartoonist: A New Way to Enhance Your Creativity.